A new addition to the FAQ series is the story of Jimi Hendrix. Accurately subtitled, "All that's left to know about the Voodoo Child", this book really does fill the gap between a basic documentary of the highlights of Hendrix's short life and a litany of uncredited and unimportant soundbytes. Although essentially chronological, the book is split into sections which cover general areas of interest but don´t naturally follow each other. So for example, there is a chapter on Hendrix's science fiction based lyrics, and later on a chapter about drummer Mitch Mitchell. Within a chapter, the sections are titled and concise giving a FAQ-like answer to the section title (e.g. Hendrix's connection with Mick Jagger). The downside of this approach is that the sections often have repeating facts (e.g. pretty much the same story crops up about Linda Keith during the "Hendrix arrives in London" section) and then in a subsequent section about Keith Richard (who was Linda Keith's boyfriend). Having said that, the book does flow well and does not overtly get bogged down with unnecessary and uninteresting facts. A good balance is struck throughout; for example there is mention of the designer of his revolutionary wah pedals, but there is no talk about which make of guitar string he used. At nearly 400 pages (but in largish font! ), the book has the space to contain explanatory notes about all of Hendrix's major songs and the key musicians that orbited Hendrix's charismatic presence. The well-known stories about the rivalry with Eric Clapton and Pete Townshend are included with an interesting piece on Jeff Beck, whom the book asserts is the one British guitarist who could stand side by side with Hendrix. I did however look out for a mention of Ritchie Blackmore who was very aware of Hendrix at the time but there was no reference. There are numerous black and white photos throughout the book but they are fairly low quality and are really only there to illustrate the points made in the text and not to make the book look good. Horses for courses, because there are plenty of Hendrix coffee table books out there and this book is not in that market. The author Gary J. Jucha is clearly a massive fan but wisely not overly zealous. He graciously gives huge credit to musicians such as Steve Winwood and the Experience members themselves regarding the creation of the Hendrix catalogue. 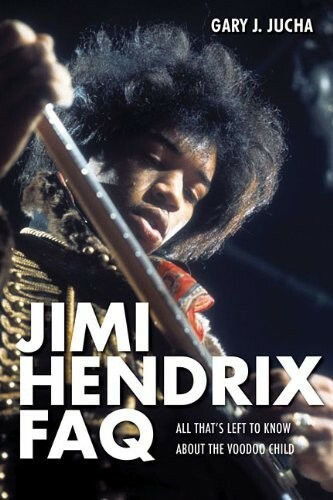 Throughout the book, Jucha recommends (and in places discourages where considered unworthy) the reading of other Hendrix books and as a result clearly wants Jimi Hendrix FAQ to be a worthy book in the collection of true Hendrix fans.